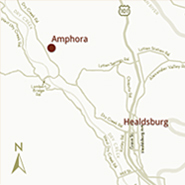 What's new at Amphora Winery! Amphora is once again open for business. THANK YOU for all of your thoughts, prayers, and good wishes sent our way during the catastrophic wildfires which began on October 8th. Please forgive us for not replying personally to each of you, but we're still in the midst of harvest. We at Amphora are grateful to be among the fortunate who still have homes and businesses because of the incredible efforts of firefighters and first responders from across our state and nation (and even from as far away as Australia). Their relentless work, finally aided by a little rainfall, is leading to containment of these numerous and widespread fires. But thousands of families in our community have lost everything, and our thoughts and efforts rightfully turn towards them. This fund is organized and administered (for no charge) by the Redwood Credit Union, the Press-Democrat, RCU Community Fund, and CA Senator Mike McGuire. 100% of your tax-deductible donations go directly to support those affected! Another way to help is by patronizing our local businesses. Many Sonoma County workers and business owners lost their homes (and sometimes their businesses as well), and the economic effects are rippling out through the entire region. Despite the severe loss of life and property, 98% of Sonoma County did NOT burn. Please continue to visit and enjoy the wine, food, scenery, and accommodations of this beautiful place. How does all that rain affect the grapes? 2018 Thanksgiving Special | 40% off! What's Behind Door Number One? Rose is back, just in time for summer!